I’m not a big fan of New Years so I decided to have a low key night this year. My friend Megan (I collect friends that have the same name as me.. it’s weird) came down to visit me and we decided to watch a bunch of movies and have fondue. And let me tell you.. it was sooo good. The last time I tried to make fondue was 3 years ago on New Years and I definitely put a bit too much wine in it… not a good outcome. But this time it was absolutely perfect and a great way to start 2010. 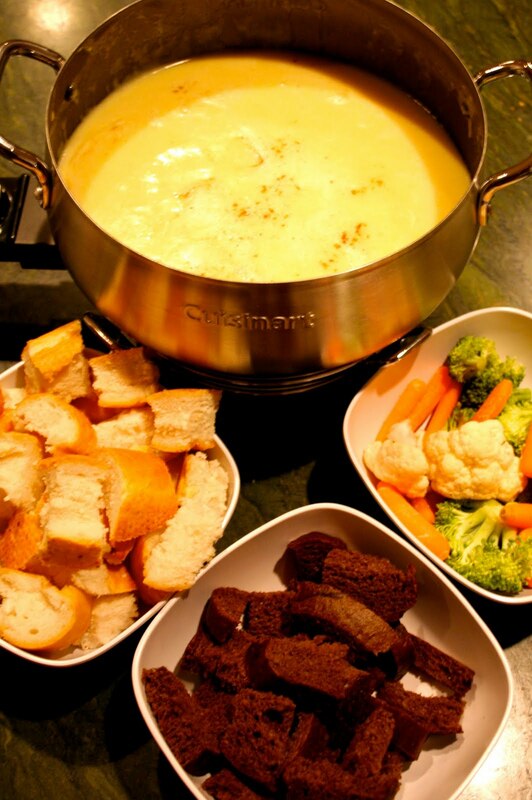 The thing I love about cheese fondue is the many different things you can use for dippers. I used broccoli, carrots, cauliflower, french bread, pumpernickle bread, steak and green apples for my fondue, but you can use whatever your heart desires. Rub the inside of a fondue pot with garlic. Then, add the wine and turn it on Medium until the wine simmers. In a mixing bowl combine the Gruyere and Emmenthaler cheeses and the flour. Reduce the heat of fondue pot to low after the wine comes to a simmer. Stir in the lemon juice. Gradually add the cheese mixture to the pot and stir with a wooden spoon. Continue until the cheese is all melted and smooth. If you would like to add Kirsch in after the cheese is melted you can. Add the nutmeg and the pepper to season. Prepare your dippers and enjoy! I’ve been wanting to make my own fondue for a while now. Well, I finally bought a fondue pot, and I have a recipe so it’s just a matter of buying the ingredients. I can’t wait!